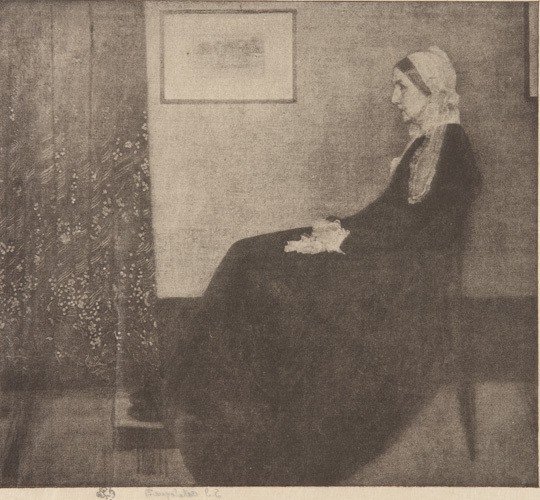 Whistler’s famous depiction of his mother, Arrangement in Grey and Black No. 1, is one of the art world’s most iconic images. The painting is in the collection of the Musee d’Orsay, but we have a lovely photomechanical reproduction at Freer|Sackler. Whistler was close to his mother, Anna, who came to live with him in London, where he painted her portrait in 1871. But what interests me now is not Whistler’s depiction of maternal serenity (severity?) but the image he painted on the wall behind his mother: a kind of painting within a painting. 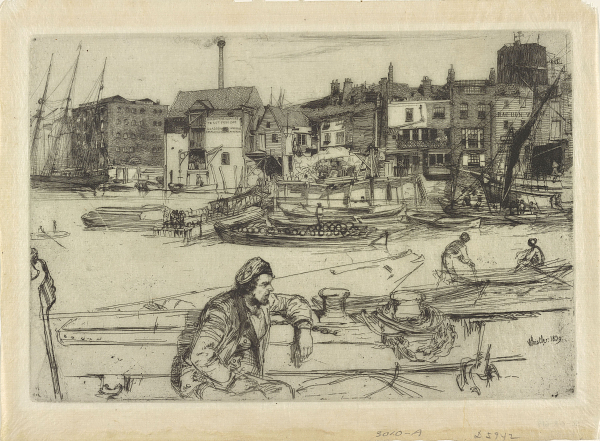 This etching, Black Lion Wharf, is currently on view in the exhibition An American in London: Whistler and the Thames, open in the Sackler through August 17. And it’s a beauty. Black Lion Wharf is the only example among the famous Thames Set in which Whistler reversed the image on the etching plate to ensure the final print read as a true depiction of the view. The real-life Black Lion Wharf was located between Downes and Carron Wharves, east of Saint Katharine’s Dock. Whistler included signboards for several wharves in the area, thus enhancing the topographically specific quality of the scene. In honor of Mother’s Day, we’re throwing in a bonus recipe from Whistler’s Mother’s Cookbook, edited by Margaret MacDonald, who is the guest curator of An American in London along with Patricia de Montfort. Set oven to 340 degrees. Whisk the eggs and yolks together until they are frothy. Beat in the sugar, lemon juice, and rinds. Melt the butter on low heat. Cool it slightly and beat it into the eggs. Pour the mixture into a buttered, 4-cup, ovenproof dish and bake the pudding for 45 minutes. Serve hot or cold. Serves 12. A delicious bright yellow custard with a sweet lemon flavor and a deep brown top.